This is part three in a series. If you have not read part one and part two, you might want to check those out before reading this one. The next morning we awoke at 6am, made our morning caffeinated drinks, and re-checked the weather. It looked like we were good to go with 10-20 from the southwest for the day and some lighter, more variable winds overnight and into the following day. We quickly decided to depart for Block, and, by 6:30, we had the anchor up. A half hour later, we were out the Cape May inlet and putting the sails up. 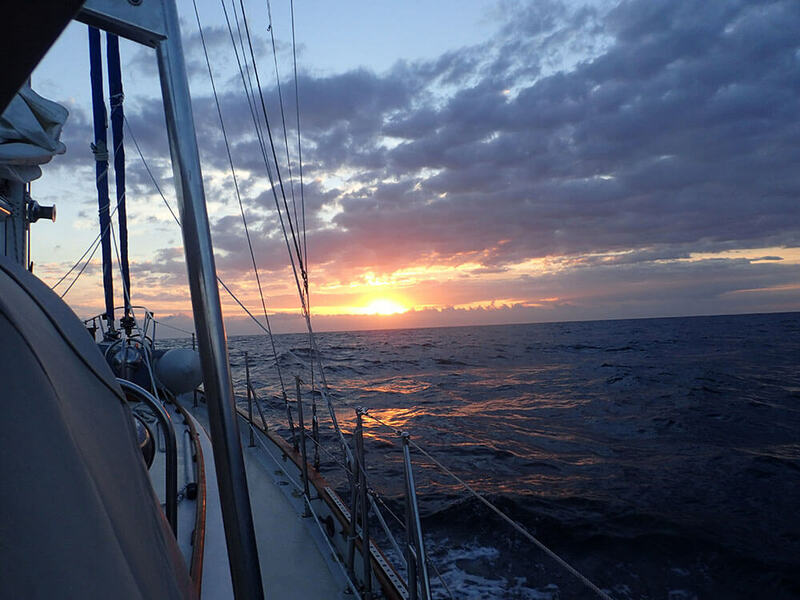 With a single reef in the main and most of the genoa unfurled, we were making over six knots. 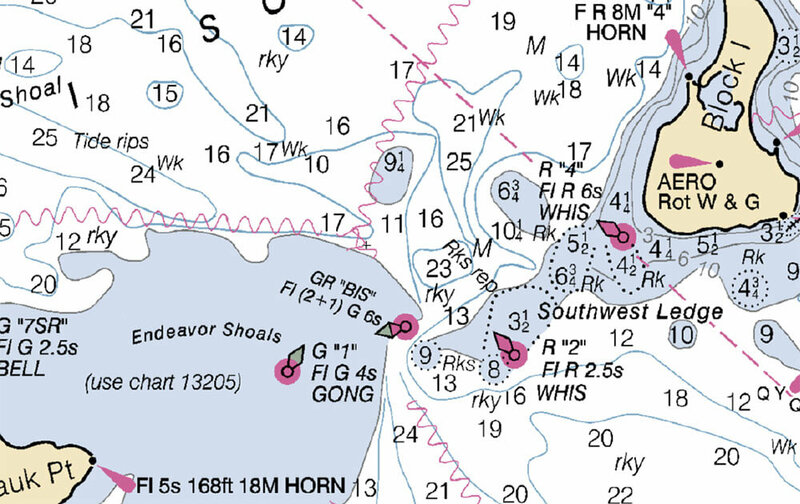 We spent the next dozen hours on the same course under autopilot, headed directly for the the green “BIS” buoy at the entrance to Block Island Sound. As the conditions warranted, we would reef and unfurl the genoa, keeping our speed in the mid-fives and sixes. We would also unzip our foul weather jackets or huddle under the dodger as the sun went behind the clouds or the wind rose a little. It was cold, but far from unbearable. With the shape of the Jersey coast – heading northeast until it started to turn more north at Barnegat Light – we stayed in clear sight of land into the evening, watching the beach towns roll by. Kerry was largely unfamiliar with the locations we were passing, so I probably bored him with descriptions and stories of the places we were off. Along the way, we also kept in contact with the Canadian boats, who were headed north to Sandy Hook. 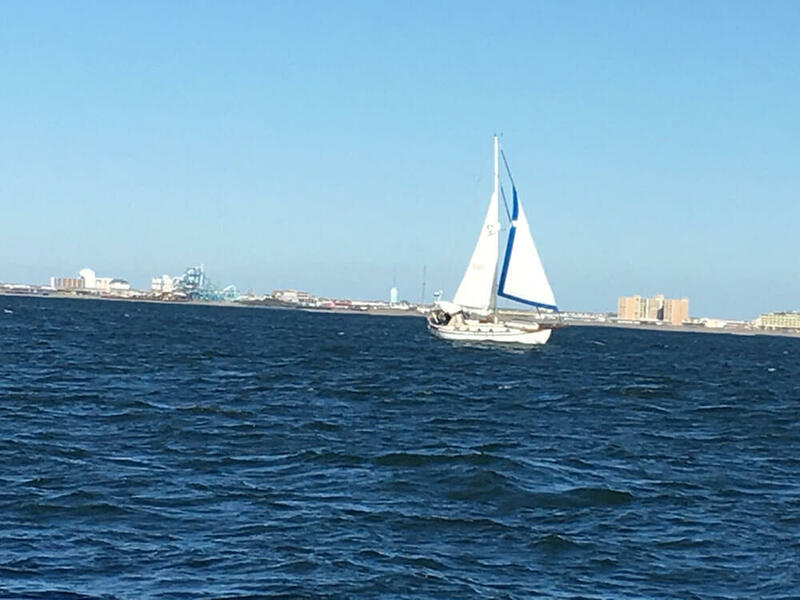 We also continued to speak with Surprise, a larger motorsailor that we had radioed with the previous day, but only saw that morning as we left Cape May inlet. He was also bound for Newport, but planned to stay coastal, heading into Absecon that evening. 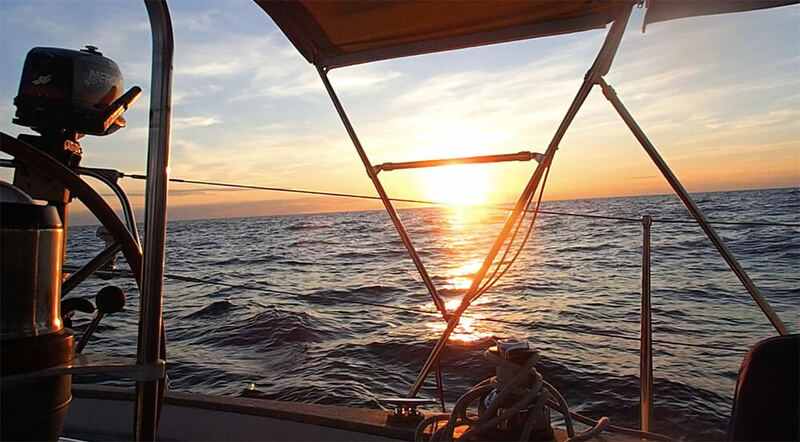 All told, life was good with the sun out and the miles rolling away under sail. Sunset somewhere off the Jersey Coast. By the evening, we had started to lose sight of the Jersey Coast as we continued on the rhum line towards Block. We had decided to do four-hour watches overnight and then nap in the morning with Kerry taking the first trick. With the sun sinking to the west, we ate dinner while calculating our 12-hour run – 70 miles – and, then, extrapolating that to an early evening arrival the next day. We also decided to double-reef the main for the night, virtually assuring we would not have to leave the cockpit in the darkness. But just as we started to get organized to effect the reef, the wind died off in a matter of minutes. So, instead of reefing, we furled all the sails and fired up the engine, putting an end to our lovely sail. And, with that, I went down below to try to get some sleep to the droning of the engine. Four hours later, at midnight, I switched with Kerry. The wind was still light to non-existent, and the sea-state seemed to have flattened out even more. Before going below, Kerry reported seeing little traffic, either visibly or on radar. In the coming hours, I would not see any vessel closer than four miles during my watch, despite passing through some of the shipping lanes coming out of New York City. In fact, besides reading and drinking a lot of tea, the only thing noteworthy about my watch was the cold. I do not know what the temp was, but it was supposed to get down to 40 at Montauk, which probably meant it was at least that cold out there. Regardless, it was cold enough. Sunrise south of Long Island. Promptly at four, Kerry came on deck. After we chatted for a bit, I went below to get some sleep and warm up. By six, I was back out there. We were still under power, but it was not too long before the wind started to pick up from the northeast, the exact direction we were headed. By eight, the wind was up to about 10-12 from dead ahead, and we were slogging into it with the residual swell behind us occasionally raising our stern and plowing us into the growing swell from ahead. Kerry went below and tried to get some rest over the next two hours. During that time, the motion actually got slightly more comfortable as the swell from astern dissipated even as the wind increased a bit more. When Kerry came back on deck, we decided to crack off slightly to port and try to get under the lee of Long Island, which had appeared off in the distance, maybe eight miles away to the north about forty-five degrees off our bow, though we were still some 40 miles from the entrance to Block Island Sound. I was thinking about coming off about 50 degrees or so and raising reefed sails, but Kerry (who has a Tashiba 36, a sister-ship to our Tayana) suggested only coming off 20-25 degrees and rolling out a scrap of genoa to give us a little power through the waves. I thought the genny would just luff at that angle, but I was willing to give it a try. When we did, our speed increased from under two knots (and occasionally being stopped dead in the water) to about three to three and a half knots. Just as importantly, the motion improved markedly. By three, the wind had started to moderate, and we were within a mile or so of the Long Island coast. So, we rolled in the little sail we had out and turned the boat towards the entrance to the Block Island Sound. Around six in the evening, we were within sight of Montauk Light, and the wind was virtually non-existent. It was turning into a beautiful, though chilly, evening with a few boats about, mainly commercial guys, but also a few other recreational craft further inshore. The final stretch into Block. As the sun set and dusk descended, we made our way past the green “BIS” buoy, hyper-alert, looking for lobster pots, identifying the flashing buoys along our approach, and watching for traffic. It was the first time I had really used our radar in a target-rich environment, and it was a lot of fun to add that to the puzzle. At times, we were even picking up loons on the radar, or at least we think we were given small blips that were appearing along with their vocalizations. Before too long, with Kerry on the bow with the spotlight, we came through the entrance to Great Salt Pond in darkness and made our way across the water to the mark on the plotter from where Margaret and I had anchored the previous year. We set the hook, put the boat away, and had a celebratory drink while taking in what appeared to be an empty anchorage.